. WHY SHOULD YOU BUY TECHARMOR ANTIGLARE BALLISTIC GLASS SCREEN PROTECTORS . MAXIMIZE YOUR RESALE VALUE . DID YOU KNOW a broken iPad Pro screen is expensive to replace. For a fraction of the price our Ballistic Glass Screen Protector will absorb almost any impact, sacrificing itself for your iPad Pro screen. Tech Armor Antiglare Glass is a low cost insurance policy for your screen, paying for itself as the first line of defense from scratches and drops. 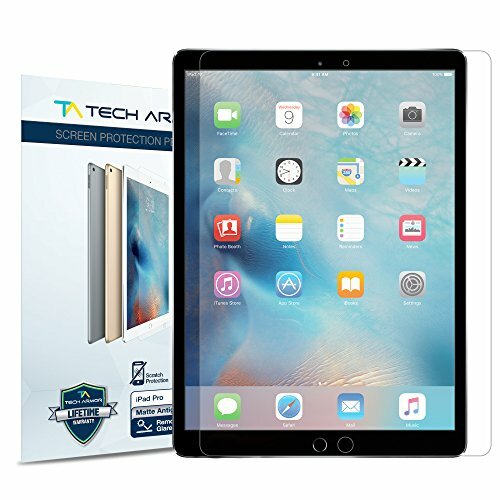 The Tech Armor Antiglare screen protector combines scratch protection with a unique matte finish dramatically improving visibility in bright sunlight or office lights. No detail has been overlooked with this Best In Class product from Tech Armor, industry leader in screen protection. If you only accept the BEST then look no further: BEST Protection from Drops/Scratches. BEST AntiGlare technology. BEST AntiFingerprint coating. BEST Touch Accuracy. BEST No Bubble Installation. COMPATIBILITY: Apple iPad Pro 12.9-inch, All Carriers, All Models (Note: Turn device display brightness up, Antiglare Screens will darken the image.) The AntiGlare Ballistic Glass Screen Protector Kit Includes: One (1) Antiglare Glass Screen Protector (.3mm 9H Rating), Installation Instructions, Alcohol Cleaning Wipe, Microfiber Cloth, Dust Removal Tape, Retail Packaging, and The Tech Armor Limited Lifetime Replacements.
. WHAT IS TECH ARMOR ANTIGLARE GLASS . Tech Armor Antiglare Glass Screen Protectors look and feel amazing. From scratches to high impact drops, you are protected. The matte finish removes glare with an Oleophobic coating to reduce fingerprints.
. HOW DOES TECH ARMOR ANTIGLARE GLASS WORK . Tech Armor Antiglare Glass is the affordable way to protect your iPad Pro screen from scratches and drops. Only premium materials and expert design go into this Best In Class product.
. WHY BUY TECH ARMOR ANTGLARE GLASS . Tech Armor is THE trusted online resource for screen protection. If you only accept the BEST to protect your iPad Pro, look no further. If you have any questions about this product by Tech Armor, contact us by completing and submitting the form below. If you are looking for a specif part number, please include it with your message.